This tape dispenser was made by the Advanced CNC class at Laney College in Oakland CA. 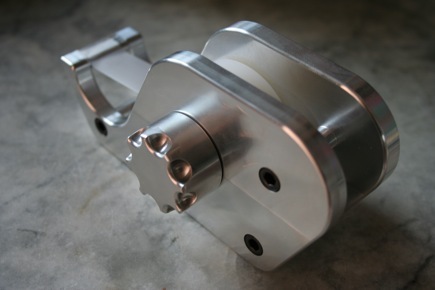 It’s made from a pound of 6061 aluminum and every part was made using CNC. Click on the picture or this link to see more pictures. Don Druckenbrodt, owner of Nite Owl Guitars, built a Solsylva CNC router that's a little bit bigger than mine. He stained his wooden parts instead of painting them like I am. Click on the picture to learn more about his router and to see what he uses it for. I took a week of vacation time just to work on my Solsylva CNC router. My goal was to spend at least 10 hours a day on it and try to get it finished. I had a very productive week but I spent most of it working on other things instead. For example, I spent parts of four days getting work done on my car because I usually have to rent one or take a vacation day if it needs service that has to be done during the day. My Camry got new tires, a bad wheel bearing replaced and a front end alignment. I also tried to get a minor EVAP (emissions) problem fixed at another shop but I got ripped off. I didn’t find out until it was too late that the dozens of very positive Google and Yahoo reviews they had were fake. I also spent about eight hours cleaning up my desk. I can’t stand it when it gets real messy and it had acquired a mountain of paper because I’ve been extremely busy this summer. Some of that time was spent calling up companies and asking them to take my name off their mailing lists. I am amazed at how many of them will send you a monthly or quarterly catalog for years even you’ve never bought anything from them or you’ve maybe placed one small order. We also had our driveway repaved because the one we had put in about eight years ago developed deep ruts where my wife parks her car. I didn’t want to have it done during my vacation but I’d been trying off and on for a year to get it repaired. I’d called at least four other companies (some more than once) and none of them showed up to give me an estimate. I finally found a one that promptly gave me one and provided good references too. So I wasn’t going to make them wait when the weather finally dried up enough for them to pave it. Getting the driveway done hurt my productivity for much of the week. I have so many tools in my small garage workshop that I’ve had to put most of the bigger ones on wheels so I can push them out in the driveway when I need more room to work. I couldn’t do that because of the new driveway and that made it much more difficult to paint my router and its stand. Painting has frequently held up my progress and if I could do it over again I’d probably stain my router’s wooden parts like Don Druckenbrodt did. One reason is my tendency to be a perfectionist. I have it well under control most of the time but I struggle with it when I do painting, trim carpentry and some other tasks where appearance is important (or I think it is). And I’ve been trying to do an especially good job on my CNC router because pictures of it are going to be on this web site and I’ll probably be taking it to some shows and workshops. I always seem to spend too much time sanding and fixing imperfections in wood, which is why I don’t do much woodworking anymore. I enjoy cutting and fitting the pieces together but I hate applying a finish unless it’s a simple project that just needs a little sanding and a few coats of Tung oil. The metal parts I make in my home machine shop often don’t a require a finish and it’s usually pretty quick and easy to apply one if they do. It usually involves just a little polishing, often with a Scotch-Brite pad, or a quick coat of paint from a spray can. I also chose the wrong paint and because of that I had to sand down my original paint job on both the router table and its stand and then repaint them. I’m about to do it again to the table but this time I’m going use a different brand of paint. I was originally going to use Rustoleum enamel which sells for about $9 per quart. But I wasn’t real happy with its durability the last time I used it on wood. So I looked around Home Depot and found Glidden’s “Trim and Door Paint.” It cost twice as much but I decided to try it because it’s a “new” oil-based “gel” paint that is suppose to dry without brush marks or drips. I won’t bore you with the details, unless you want to hear them, but I got a lot of brush marks and runs even though I carefully followed the directions on the can and watched the instructional videos on YouTube. I blamed myself after my first try but after my second try I decided it was the paint. It also took Home Depot more than two months to get me the “Rich Blue” I wanted. Glidden’s Trim and Door paint can’t be tinted and the color I wanted was one of two they don’t stock even though they advertise them. To be fair, they did try hard to get me the paint. I ended up having to special order six cans and then they refunded the cost of the five I didn’t need. Other things also interfered with my original plans but I’m not really complaining. I had a very productive week and I got a lot of important things done. The router just wasn’t one of them. I’ve been away on vacation which is why MachinistBlog.com has been so stale. We only went away for one week this year but I always seem to spend the week before running around like crazy getting ready to go and then the week afterwards working like crazy to get caught up at work and with chores around the house. If you’re wondering, wifey and I went to Washington D.C. and did typical touristy things which included visiting a lot of museums. We enjoyed the American History Museum and the Udvar-Hazy Air and Space Museum at Dulles Airport the most. After getting the lawn cut I spent several hours today shopping for stepper motors, a 4-axis driver and other electrical components for the Solsylva 25×25-inch CNC router I’ve been building. I haven’t been able to work on it as much as I’d like but I have been making steady progress. And during the first week of October I’m going to do something I haven’t done in about 10 years, which is to take a week of vacation and stay home by myself to do things that I want to do. And my goal is to get the router finished. But to do that I need to get my electronics and leadscrews ordered by tomorrow. I should have done it at least 2 weeks ago. I was going to buy my electronics from Hubbard CNC, a company I highly recommend because they have excellent prices and service. They usually have a 4-axis kit with stepper motors, driver board, power supply and “extras” for a good price but I didn’t see one. So I sent them an email with my phone number and Brent Hubbard called me within a few hours. He was willing to quickly put together a kit and get it in the mail. That offer and our nice conversation increased my opinion of him and his company even more. Unfortunately, Brent’s call was too late. I’d already found and decided to splurge on a 4-axis Gecko G540 controller sold by Deepgroove1 with four 270-oz stepper motors for $601 with shipping. Their kit is almost completely ready-to-use. The Gecko is already installed in a nice enclosure with the power supply and the motors have cables and connectors already attached to them. All you have to do is mount the motors on your machine, plug everything in and configure Mach3 or whatever controller software you’re using. It’s about twice the price of a kit with a cheaper controller but there’s no soldering to do and no searching for a suitable enclosure, cables and connectors. You can’t get much better controllers than Geckos but they are expensive. A 4-axis G540 by itself usually goes for about $250 and 4-axis TB6560 based driver is about $86 (a 3-axis board is about $75). If you want to try one of them then I highly recommend buying it from Hubbard CNC. There are dozens of vendors selling them on eBay and you can probably save a few dollars buying one from someone else. But they’re notoriously hard to set up and Brent’s drivers come tested, with documentation that makes it easy to get them running and some “extras”. Brent told me they also sell some single axis drivers (P55052/P56056?) that work very well but I can’t tell you much more about them than that. If you’re wondering why I need a 4-axis driver and 4 stepper motors for a 3-axis CNC router, it’s because it uses dual leadscrews for the X-axis. I’m going to connect a stepper motor to each screw instead using one stepper and timing belt and pulley system. It won’t cost much more and it will probably take less work and be more reliable. Mach3 makes it very simple to slave one stepper motor to another. The stand for my Solsylva 25×25-inch CNC router is made from 1×4-inch pine boards. Two of the supports are hinged so you can fold the router down so it takes up less storage space. Building the stand for my Solsylva 25×25 CNC router was pretty simple. The hardest part was attaching the hinged support. I also had some trouble finding straight lumber for it and the rest of the router. David Steele’s instructions and drawings are excellent and are easily among the best I’ve ever seen. The stand supports the router and it provides you with a work table to build it on. 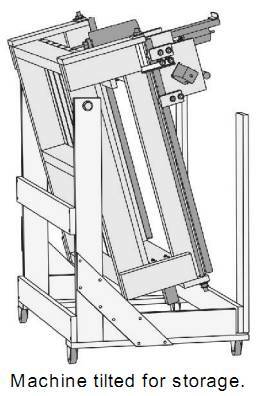 It can be put on casters so you can easily move it around and it’s designed so the CNC router can be tilted down to take up less storage space. It’s a pretty good design but I wish I’d just built a table out of 2x4s instead, because the fold-down feature doesn’t really save much space and it may never get used. Such a table would be stronger and unlike David’s design you could add shelves to it for storage, or compartments for a computer and/or dust collection system (shop vac). There are 109 pages of instructions and drawings that are very well written and drawn. David Steele doesn’t just provide you with some drawings and general instructions and then leave it to you to figure out the rest. 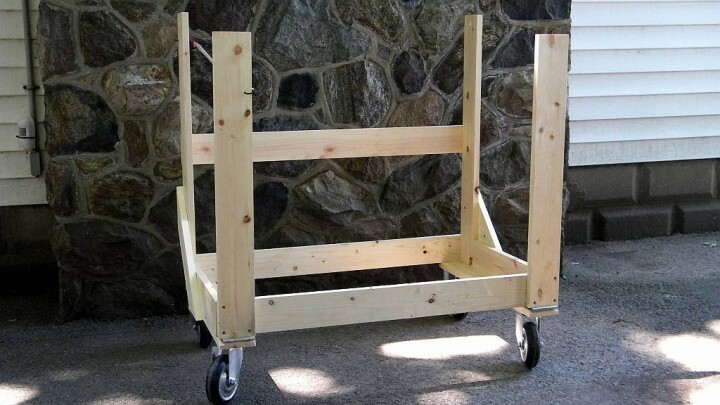 He breaks the entire construction process down into a series of small steps that almost anyone can follow, even someone who doesn’t have a lot of experience building things or working with tools. 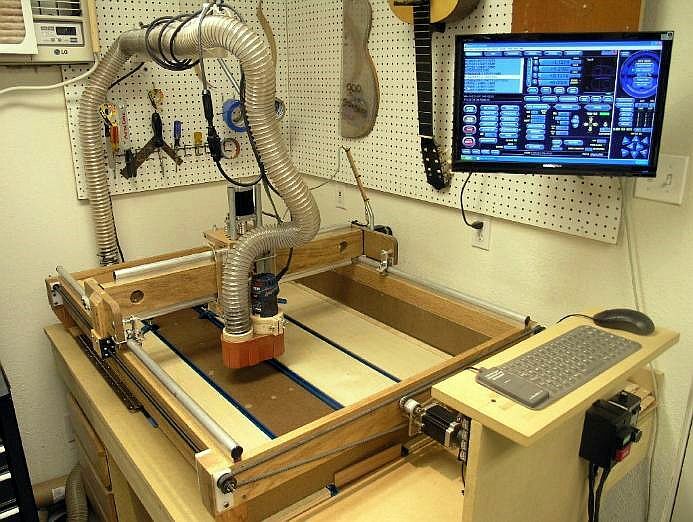 He designed this CNC router so it could be built with very basic inexpensive tools and so you can buy most of the materials at your local lumber yard or home improvement center. Those are huge advantages for many. But the downside is the router isn’t as good as it could be if were designed to be built with better materials and by someone with more skills and access to better tools. I hope that someday David will offer an “advanced” design or add more options to his current plans, such as an extruded aluminum or welded steel frame. In the meantime you can learn about modifications and upgrades by reading about what other builders have done. CNCZone.com is one of the best places to do that and you can find some great builder’s logs there. Unfortunately, the best message threads have often grown to contain dozens or hundreds of messages and it can be very time consuming to read through them all. It’s really important to use the straightest boards with the fewest knots you can find, especially for the router’s frame and gantry. It seems that lumber quality is getting worse because of “factory forestry” and I spent almost two hours patiently sorting through entire piles of lumber to find the best boards. At one point I thought I might have to come back again or go somewhere else to find enough good 2x4s and 2x6s. I’m glad I purchased extras because when I got home I found that some of them weren’t as good as I’d thought.